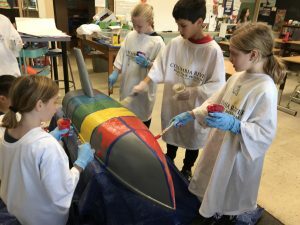 The deck design is working on splitting into 3 different groups each has 2 different people and drawing designs for the aft (back of the boat). 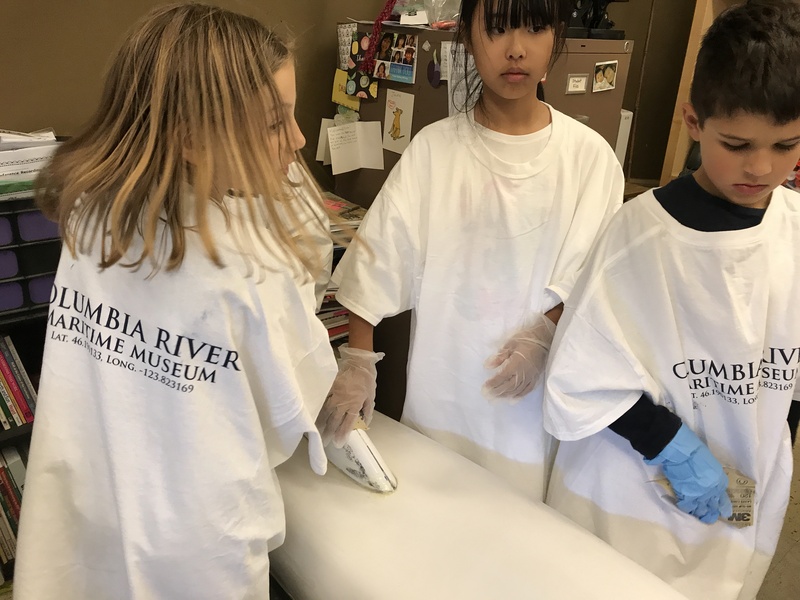 Then they will vote on what design they want to do and then print it on rice paper and then cover the rice paper in epoxy. Then it will dry and the rice paper will dissolve leaving only the drawings. The hull team is splitting into groups to divide the work. They will be painting a rainbow and in the red and orange sections they will paint a sunset. On the other side they will paint small pictures that consist in two different colors and in the middle a logo that represents Portland. They chose who would paint which color. They put duct tape to separate the different colors and then when the different colors dry they will take the tape off. They started with blue, red and yellow and then they will mix the colors to make the rainbow. The IRR team is writing the blog. We are writing and translating the finder’s instructions with google translate, and then we are writing letters to ask for parents to translate them. We are also figuring out which currents in the Pacific Ocean the boat could take so that we know which languages to translate the finders instructions into. We will then print them on rice paper and cover it with epoxy so that when it dries only the ink will be left. The ink must be black so that it will not wash off easily. The sail team did two rough drafts on paper and then they drew with pencils on the sail. Then they will sharpie with sharpies, Each class member wrote their name on the side of the sail by a heading of the team they are a member of. The sail team went to each person and asked which color they wanted their names to be. 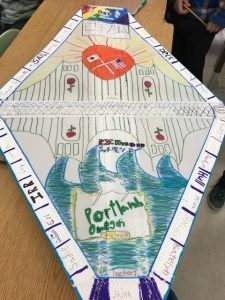 Some things the sail team wrote drew was the American flag, Japanese flag, rose, the Portland Oregon sign and the St. Johns Bridge. 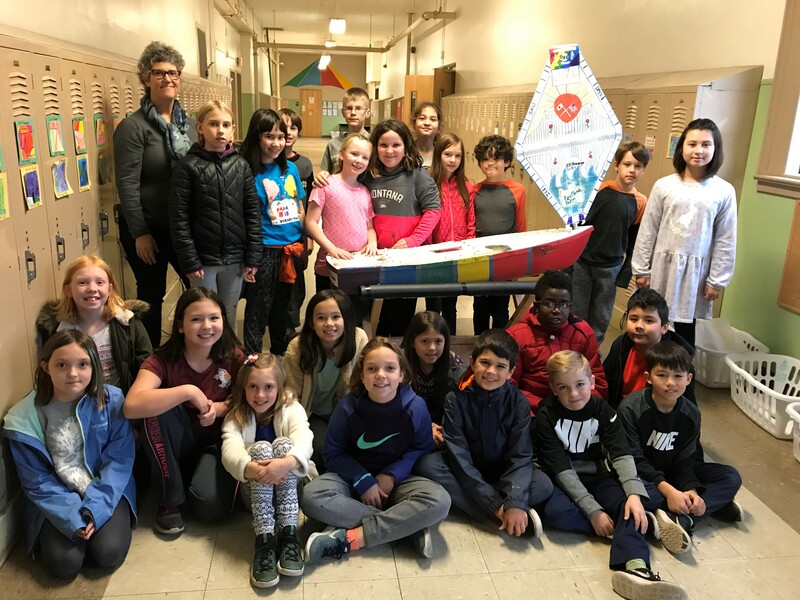 We have been very busy making the boat and we hope it makes it to Japan. While visiting Richmond Elementary today, in the midst of painting the boat for Japan, my phone began buzzing in my pocket. When we cleaned up I saw I missed a call and a text from Capt. Jordan of the Columbia River Bar Pilots saying the CS Decisive was leaving today at 3pm and would launch a miniboat for us on their transit to Panama! The problem was… it was 1pm and I was in Portland, almost two hours from Astoria and we still had tasks to complete. At 1:30 I hit the road and got stuck in Portland traffic. Luck be have it, though, the ship was delayed and I rushed to the pilot station where I was met by two very happy boat operators and one very excited bar pilot. 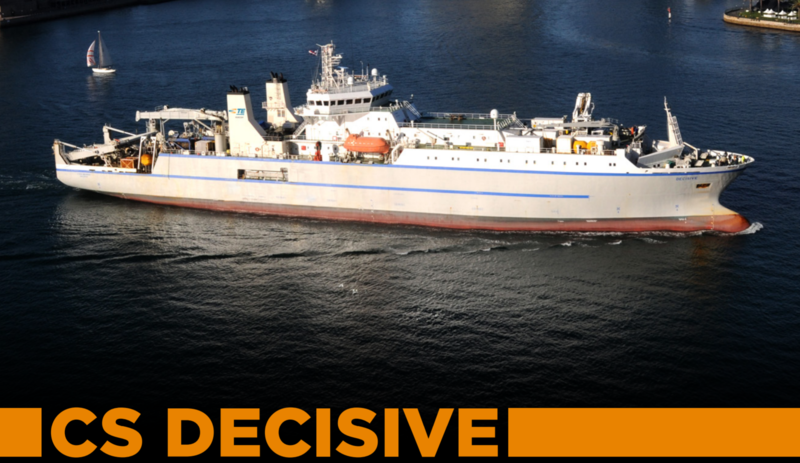 We immediately delivered him and the S/V Nishikaze to the CS Decisive. I can’t wait to show the kids this story. We are asking them to launch south of Los Angles, but the students will make the final call as they have lots of ocean to choose from! What a perfect day onboard the Cable Ship Decisive for the launching of the S/V Nishikaze. This morning we unlashed the Nishikaze and prepared the vessel for launch. Chief Officer McDonald rigged the sail and ensured it was secure. The solar panel was cleaned and a final check of the vessel was completed. 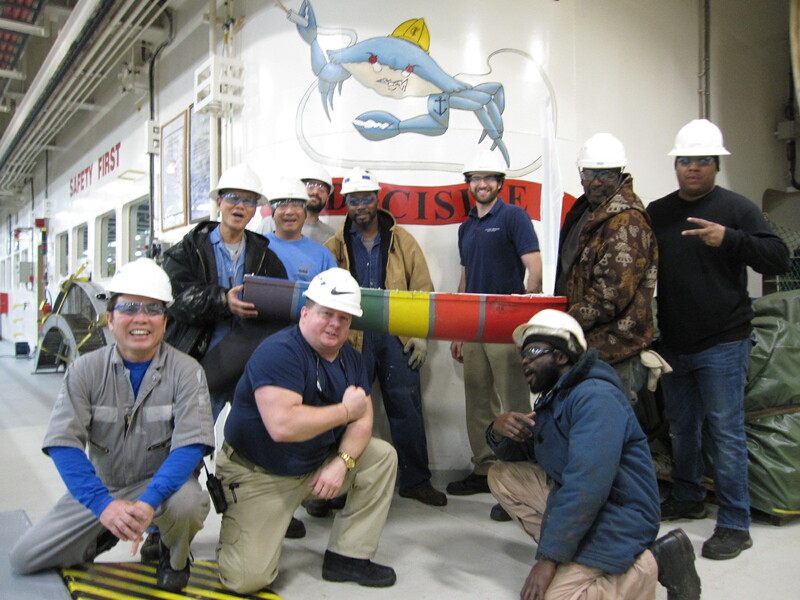 Many of the crew stopped by for a photo and to wish the S/V Nishikaze a safe and successful voyage. At 1300LT I informed the Chief Engineer that we would commence slowing the engines in order to stop the Decisive. During this time the Chief Officer, Bosun and crew prepared lowering our portside accommodation ladder. At 1330 the Decisive was completely stopped and on a heading that would ensure the Nishikaze would sail away from our hull. At this time we said our goodbyes and released the MIGHTY Nishikaze. After monitoring the vessel for 10 minutes the Nishikaze was stable and sailing on a heading of 190 degrees and moving at 0.8-1.0 knots. The crew, feeling good that it was a successful launch, prepared the Decisive to continue our voyage to the Panama Canal. 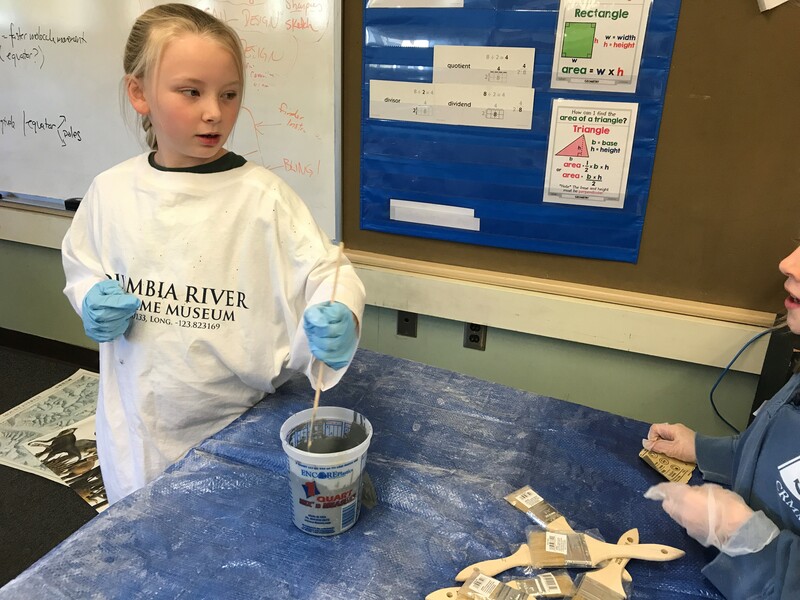 especially the students of Richmond Elementary to let us participate in such a fun project. It was a real honor and we all look forward to tracking the S/V Nishikaze. We wish her favorable currents, following seas and many sea miles ahead. 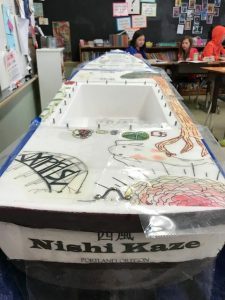 On March 21, 2019, 424 days after the Nishikaze was launched, we received an email that said, “We found one boat and a small plastic paper with a piece of paper write on this website.” After a few email exchanges we discovered that the boat was in fact the Nishikaze, who had stopped sending its location two months before! The message came from Monika Eeru, who lives on an atoll called Tarawa which is part of the island country Kiribati in the central Pacific Ocean. This spot is 8,015 km from where she last reported on January 4, 2019! 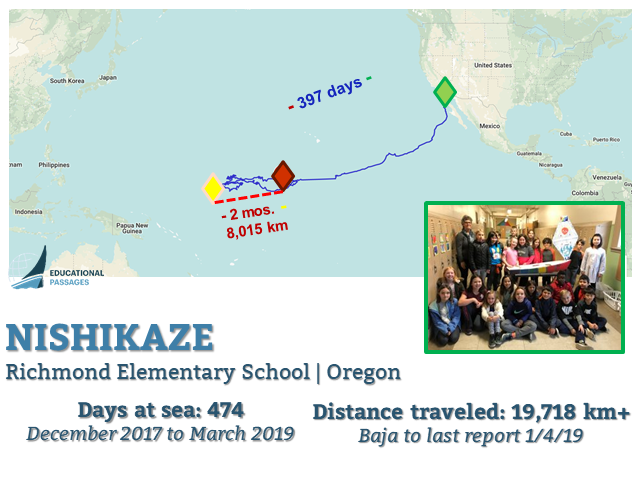 The Nishikaze sailed for 474 days and traveled AT LEAST 19,718 km (from Baja to the last GPS fix 1/4/19)! 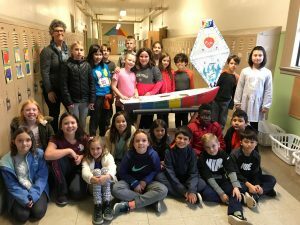 Prepared by Jaina Kapranos’s 4th grade class. 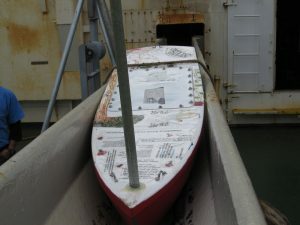 It is the second boat to launch from the Columbia River Maritime Museum.